OK. So I'm a little late. I've been planning on doing this post since mid-May. Hmmm. My porch got in the way. And my dining room. And my china cabinet. And garage sales. And the fact that my children are WAY beyond the age where they need my help for Father's Day gifts. But I wanted to do this post because if my kids WERE young, I would SO have them make one for their father. This is probably my favorite of all the art my daughter brought home from grade school. Of course it didn't look exactly like this - it was just the construction paper hands. I put it on a large piece of foam core, cut a mat to fit the foam core and then cut glass to fit. I got these handy dandy little clamps that hold foam core, mats and glass together from the Hobby Lobby and I had a piece of art that I loved. There was a small problem though. You see the colors above? Those are the colors of the construction paper before it faded to the colors it is in the first picture (these are the backs of the paper that were against the foam core). I have redone this piece a couple of times over the last 18 or so years just to refresh the faded colors. 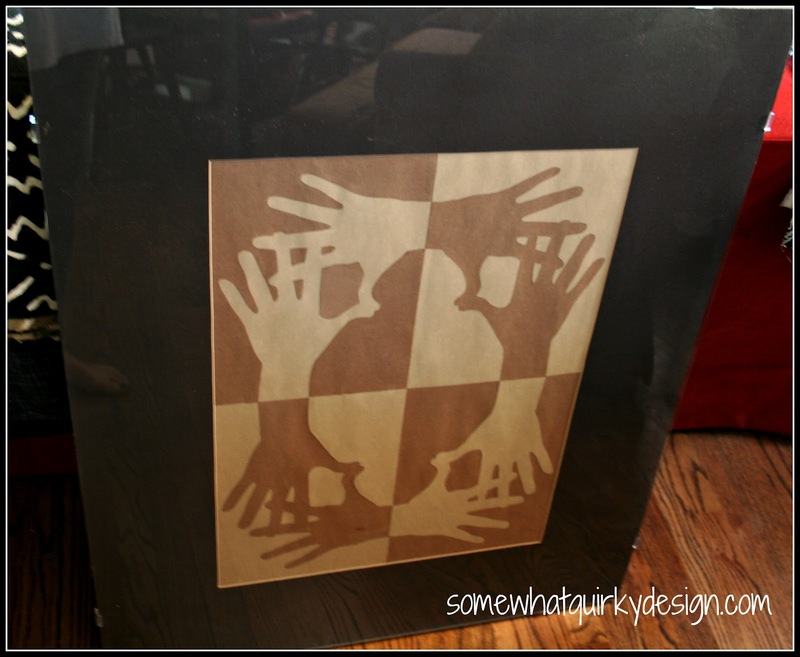 This is easy to do by deconstructing the original, tracing the hand prints and then cutting and reconstructing the piece. 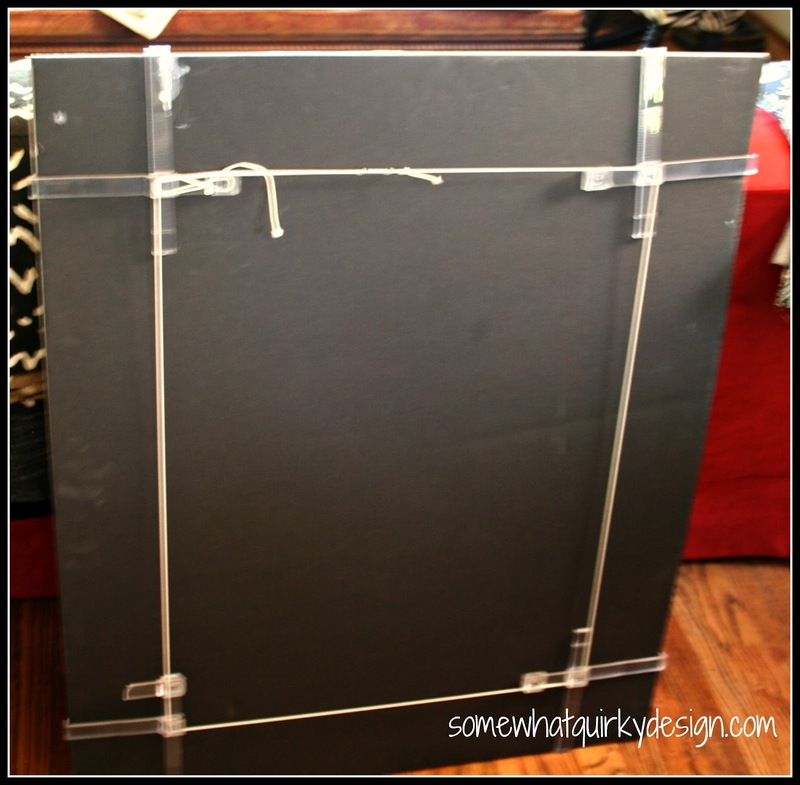 This is an easy project that I think yields big results. To do this you need two colors of paper. Construction paper choices are very limited these days, and not available in the same sizes as it used to be. It is also expensive. 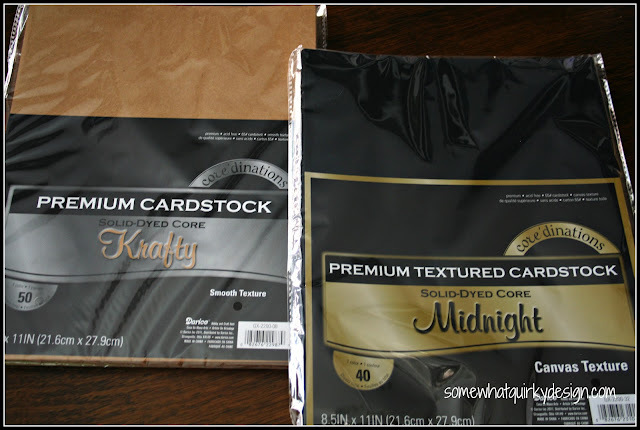 It was cheaper to buy these two packages of nice cardstock at JoAnn than it was to buy a package of construction paper. 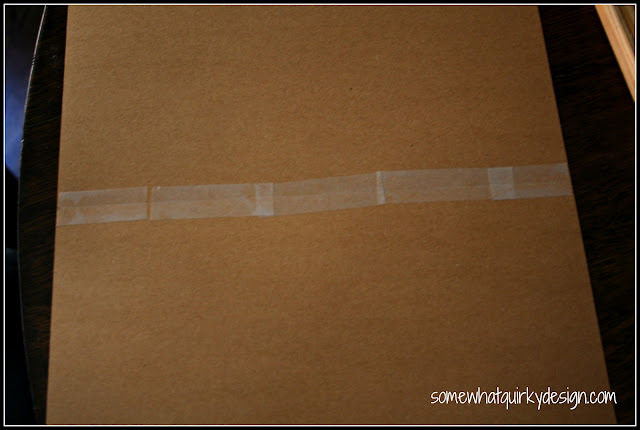 Piece together the long sides of two pieces of paper to make one large piece of paper. Do the same with your second color. Trace your child's hand onto a piece of scrap paper. Cut that out, trace it and cut out another hand. 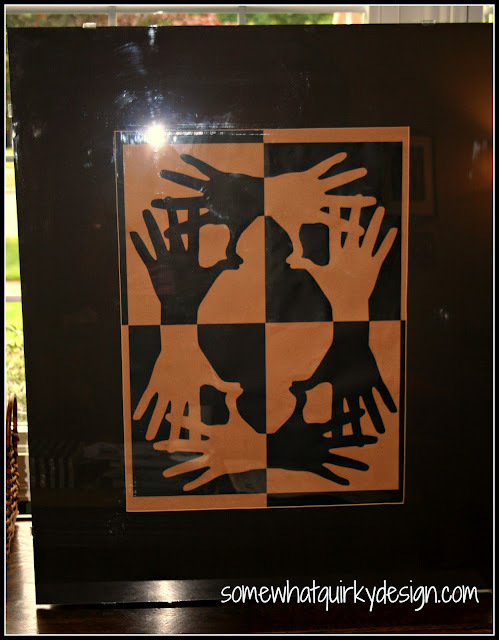 Lay those hands together, weaving the fingers together so that they look something like the hands below and fit onto one of the pieces of card stock (or other paper). Trace onto card stock. Cut out. Be sure to cut continuously from the side of one hand to the side of another. You should have only two pieces of cut out. Very carefully cut out the inset pieces ( I used a razor for this). You want these pieces to be smooth because they will be used on the mirror image side. 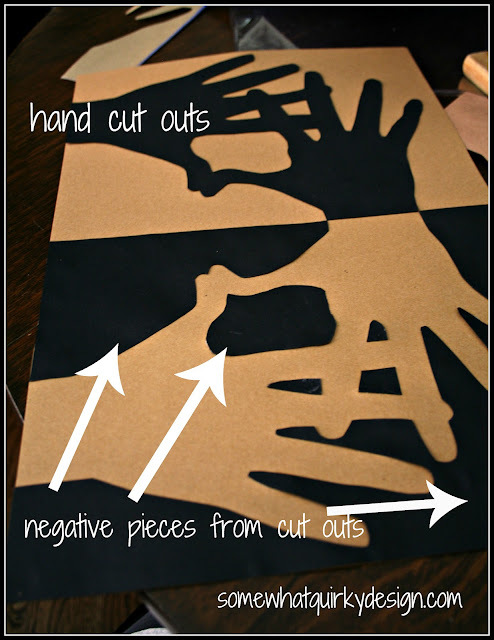 Lay the set of cut out hands onto opposite color of paper. On the adjacent piece (that you have taped to the first piece) lay the negative pieces that remain from your hand cut outs. 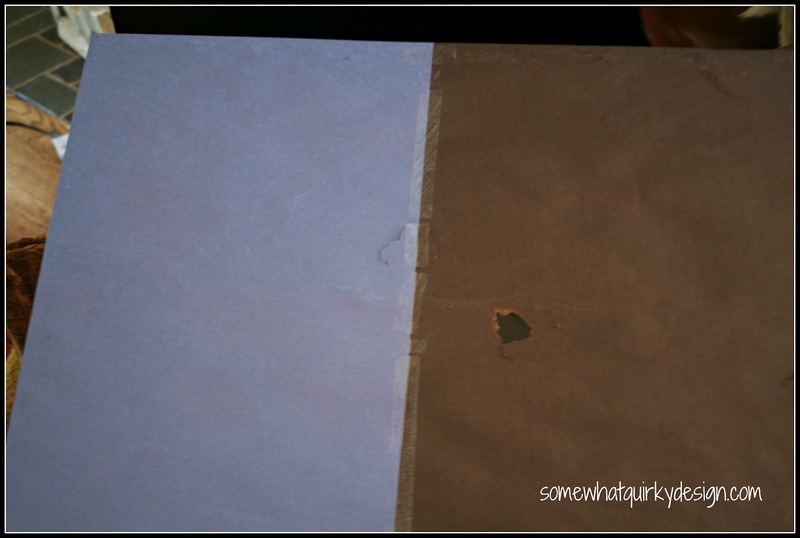 Attach hands etc to background paper with glue or double sided tape. Do the same thing with the 2nd color. Tape the two sets of hands together (on the wrong side of the picture) Be sure you attach so that wrists match up as in the picture below. NOTE: check this placement before you glue your second set of hands into place so that they are the mirror image of the first pair. Frame as desired. Since I used smaller pieces of paper and was reusing my mat from the original, there was a space to fill between the edge of the artwork and the edge of the mat. I just filled in the background with more card stock - using the opposite color as the background in each quarter of the piece. I think this could be done with the hand prints of multiple children, although you would not have the perfect symmetry that you get with the mirror images in all directions. I think this is interesting and masculine enough for dad's to hang in their office. What do you think? I guess I could say that I'm not late - I'm just really early for next Father's Day! I love it. What a great idea for Father's Day. Did you get a little misty putting this together? What a great project, Karen. I'm going to file this in my brain in case my girls ever get busy and make me a grandchild. It's my clock that's tick'n now.